It was at this point that my first folded-in-half subscription copy of JUSTICE LEAGUE OF AMERICA arrived in my mailbox, a welcome surprise, though I was dismayed to learn that I’d missed two issues in the meantime. Also, at this point many of DC’s covers began to look crude and rough–the inking tended to be thick and heavy, many of the characters appeared routinely distorted. Artist Ernie Chan (then working as Ernie Chua due to an immigration snafu) worked on a lot of these–he was a fine artist, but one that didn’t have a great instinctive grasp on the sort of stylized exaggeration demanded by super heroes. Consequently, his figures often looked like water-filled balloons. Despite the fact that this was the second chapter in a two-part story, I didn’t have any difficulty getting up to speed, as writer Cary Bates took the time and space to recap everything of import that had happened previously. 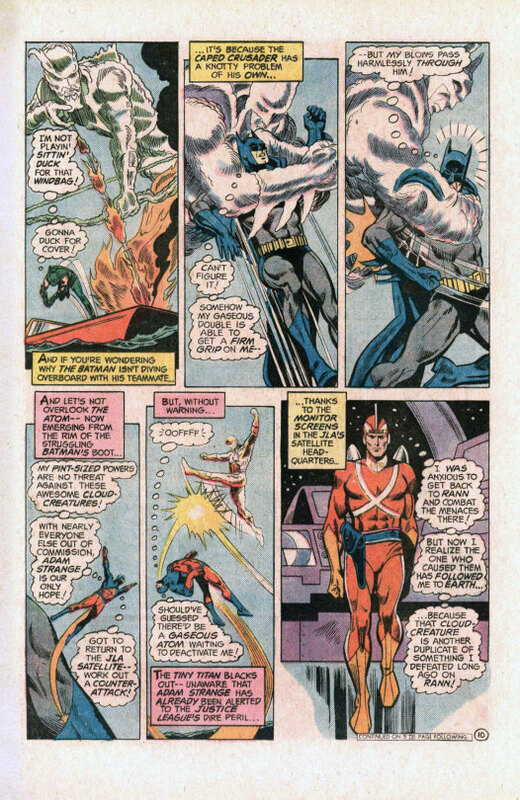 So we begin on the JLA satellite in the middle of a meeting when suddenly Adam Strange materializing in the League’s midst. What’s more, Adam is carrying the empty uniforms of five missing Leaguers. 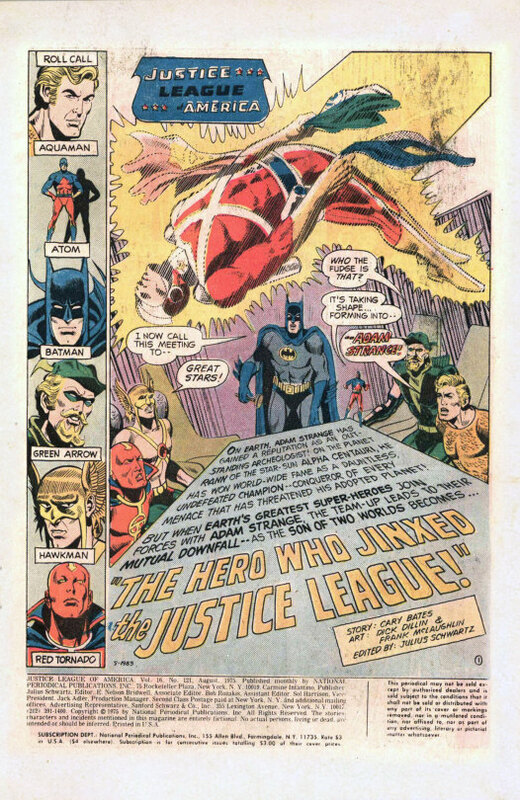 He updates the rest of the team as to how these JLA members had been mysteriously transported to the planet Rann, where Adam was being attacked by resurrections of foes he’d defeated in the past. Already, Adam’s fiancee Alanna had been disintegrated, and despite the assistance of the Earth heroes, Adam was unable to destroy the colossal Borg a second time, and so the Leaguers joined Alanna as victims. 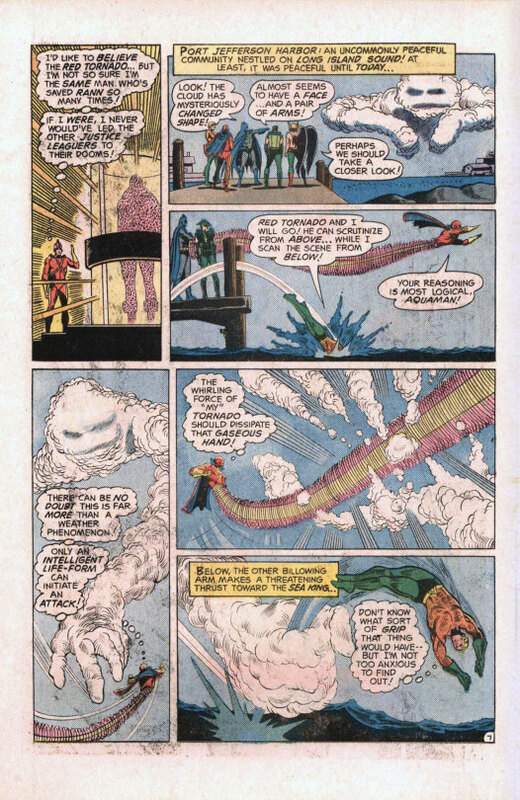 Green Arrow is quick to get on Strange’s case for his failure, but before the argument can grow too heated, the JLA’s monitors detect a monstrous cloud-creature menacing Long Island. Adam is forced to remain behind on the satellite as the Earth is poisonous to him at this point, but the rest of the team beams down to engage their cloudy enemy. But the cloud creature is tougher than it looks, and it pummels the heroes. eventually dividing itself into cloudlike doppelgangers of each of them which proceed to kick them into the dirt. Back on board the satellite, Adam moves to beam down and give assistance, but his rescue is blocked by the appearance of his and the League’s old for, Kanjar Ro. 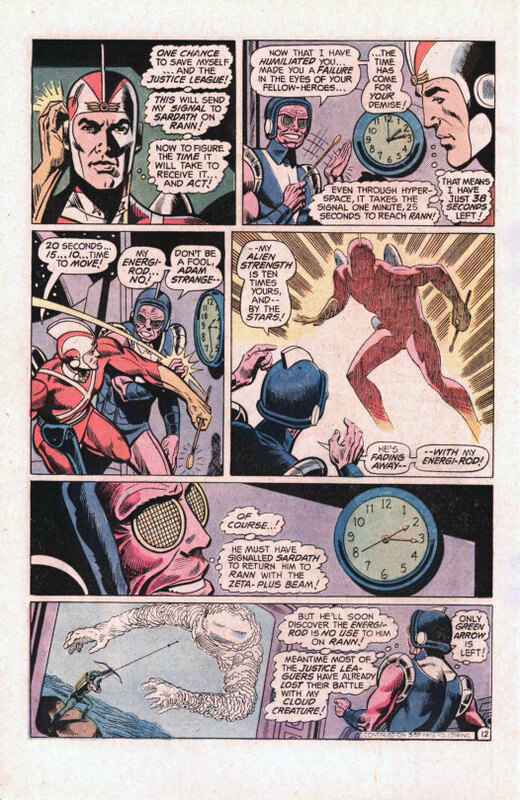 Kanjar reveals that he’s been behind the resurrected enemies that have plagued Adam and the League, but as he gloats, Adam grabs the villain’s Energi-Rod as he triggers the recall device that Zeta-Beams him back to the planet Rann. There, the scientist Sardath is able to work up a brainwave converter that allows Adam to use the Rod. He locates strange spheres in a cavern, which turn out to be the missing Leaguers. Adam is conscientious enough to tell the Rod to attire them in their original costumes while returning them to human form, luckily for the Comics Code. But that’s not all–there’s a sixth sphere in the cavern, which of course turns out to be Alanna. 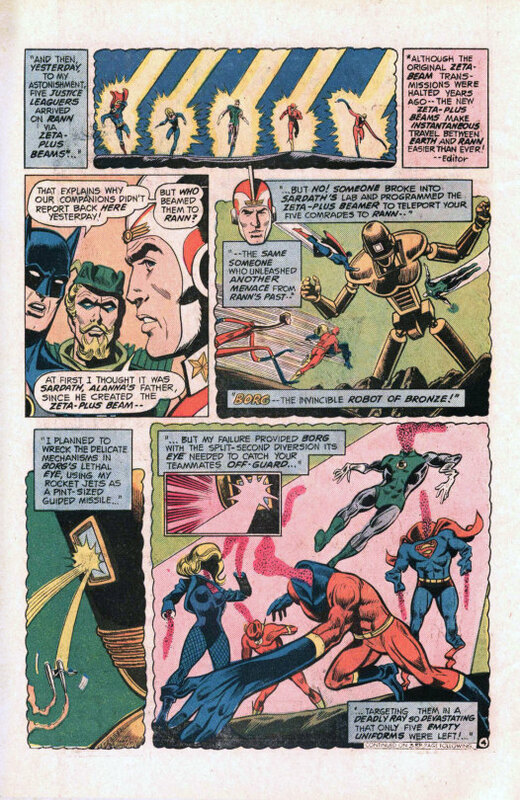 Now restored to fighting fitness, the League members Zeta-Beam back to Earth, arriving in time to prevent Kanjar Ro and the Cloud Creature from finishing off their teammates. The issue ends with a wedding ceremony attended by the entirety of the League, uniting Adam and Alanna in matrimony. This was the first super hero wedding I ever experienced.